Upper Seymour River Provincial Park takes in the headwaters of the Seymour River, which forms the major drainage system into the Seymour Arm of Shuswap Lake. The 10,672 hectare park has provincially significant conservation values associated with representation of a wide mountain valley within the northern Columbia Mountains, with steep mountain slopes enclosing old-growth interior wet-belt forests and extensive river and wetland environments. The Upper Seymour Valley has a long elevational range of forest types from lower Interior Cedar-Hemlock forests, through Sub-alpine Fir - Engelmann Spruce forests to alpine habitats, with much of the forested stands in old growth condition. The extensive wetlands, slide-paths and forests are important habitats for grizzly and Mountain Caribou. The lower park section is narrow and bound by forest harvesting roads and extensive cutblocks. The upper portion is in pristine wilderness, with no apparent sign of human use. The high glaciers and alpine tundra at the north end of the park are used for heli based tourism activities: skiing, touring, mountaineering, fishing and hiking. The park is accessed by 40 kilometres of generally good two-wheel drive gravel roads from the community of Seymour Arm, which in turn is a 40 kilometre drive on gravel surface from the end of the paved road on the north shore of Shuswap Lake. Seymour Arm can also be accessed during the summer by a small car ferry. History - This protected area was recommended through the Okanagan-Shuswap LRMP (Land and Resource Management Plan) process and formally established as a Class A Park on April 18th, 2001, through Order-in Council under the Protected Areas of British Columbia Act. Conservation - The 10, 672 hectare park has provincially significant conservation values associated with representation of a wide mountain valley within the northern Columbia Mountains with steep mountain slopes enclosing old-growth interior we-belt forests and extensive river. The very lower end of the park is in the Shuswap Highlands Ecosection. There is a large mountain valley, extending from low river floodplain at 600 meters elevation to steep narrow headwaters that culminate at Seymour Pass at an elevation of 1200 meters. The valley sides are steep with numerous avalanche paths and streams leading from high mountain ridges and basins. The lower floodplain ecosystem is highly complex with river riparian and oxbows forming extensive wetlands of shallow ponds, marshes, wet meadows, fens and shrub carr habitats. 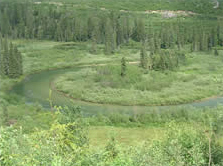 Wildlife - The park has extensive spring habitats for grizzly bear and seasonal habitats for mountain caribou. Mule deer and moose also inhabit the park. A small number of swans can be seen in ponds along the river during the summer. The river has native stocks of rainbow trout, and possibly bull trout. Opportunites exist for catching Rainbow trout, Bull trout and Whitefish. Species restrictions in river, please refer to the current regulations for further information. Anyone fishing or angling in British Columbia must have an appropriate licence.